Lock in a great price for NH Catania Centro - rated 8.2 by recent guests. The staff went out of their way to meet all our requests, (extra pillows, billing corrections, iron and iron board), and were always available to assist. Very comfortable rooms and good location. Superior rooms have a nice view stretching out to the sea. 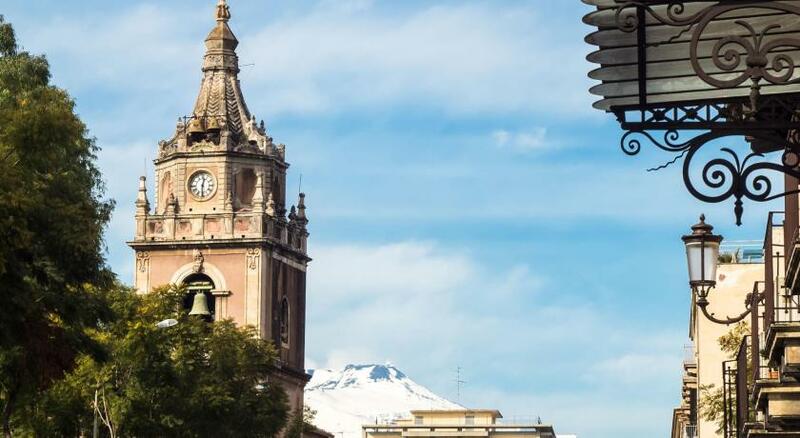 The location of the hotel is in the centre of Catania, making it accessible to the city by a few minutes walk. There is also a bus stop in front of the hotel where public transport buses and the airport shuttle bus, ALIBUS, pass making it quite convenient for travelling. Beds are super comfortable and although we did not opt for a balcony we really liked the lengthy, vertical window overlooking the city. Free luggage deposit was a plus for us! Perfect location & nice atmosphere. The rooms are quite spacious & comfortable. Location was perfect for getting around the city. The breakfast was extensive and delicious...just about the best meal of my day and included in the price of the hotel. The housekeeping staff was very attentive, and the desk staff was very helpful. Good location and reasonably quiet. The bed was comfortable and the bedding clean but although the bathroom had been cleaned, it didn't feel clean because of the broken tiles and black mould along the edges. Ditto the bedroom, which was clean but with marked walls and tired carpet. One of our top picks in Catania.NH Catania Centro is an elegant hotel in the heart of Catania, a 5-minute walk from the shops of Via Etnea. It offers free Wi-Fi and spacious rooms. The restaurant serves Mediterranean cuisine. From 07:00 a varied buffet breakfast is served on the first floor, in an elegant, bright area. Early breakfast is available on request. The Court of Justice is 200 yards from the hotel and Corso Italia is a 4-minute walk away. NH Catania Centro has been welcoming Booking.com guests since 8 Jul 2009. When would you like to stay at NH Catania Centro? Classically decorated room with air conditioning, free Wi-Fi and satellite TV. Large room with modern furnishings in white beech-wood. Features air conditioning, free Wi-Fi and satellite TV. Featuring views of the city, this air-conditioned room has a minibar, soundproofing and a flat-screen TV with satellite channels. The private bathroom comes with free toiletries and a hairdryer. Free WiFi is offered. Large room with view and modern furnishings in white beech-wood. Features air conditioning, free Wi-Fi, satellite TV. Large room with view and modern furnishings in white beech-wood. Features air conditioning, free Wi-Fi, satellite TV and an extra bed. NH Catania Centro rooms are elegantly furnished, equipped with many comforts, including air conditioning, desk, direct dial telephone, as well as free Wi-Fi. Some of them have a beautiful panoramic view of the city. Moreover this hotel is ECO-FRIENDLY; certified according to ISO 14001 and 50001 standards. House rules NH Catania Centro takes special requests - add in the next step! NH Catania Centro accepts these cards and reserves the right to temporarily hold an amount prior to arrival. There was a rich breakfast buffet, including vegan and gluten free options. What I noticed upon arrival, the keyboard of fhe receptionists is under a big layer of dirt and looks discusting... I am sure this is threat for the health of the staff. Please clean or replace those keyboards. I hope you appriciate my comments, it is meant constructive. The rooms are not very clean. The bathroom looks like a new refurbishment, but it smelled like urine. The carpet for the room needs replacing very, very badly. It looks worn and grungy (we had a superior suite). This is not inline with NH brand quality and needs to be addressed. Only one set of towels and bathrobe when the room was booked for 2. No big deal but it is annoying. There is no concierge desk unfortunately. When we checked in, the room (for two persons) had only one big towel and several small in the bathroom, also there was only one shower gel and one shampoo ( the small hotel size ones) and nothing more, which I expect for a 4* hotel.